The study of Roman sculpture has been an essential part of the disciplines of Art History and Classics since the eighteenth century. From formal concerns such as <em>Kopienkritic</em> (copy criticism) to social readings of plebeian and patrician art and beyond, scholars have returned to Roman sculpture to answer a variety of questions about Roman art, society, and history. Indeed, the field of Roman sculptural studies encompasses not only the full chronological range of the Roman world but also its expansive geography, and a variety of artistic media, formats, sizes, and functions. Exciting new theories, methods, and approaches have transformed the specialized literature on the subject in recent decades. Rather than creating another chronological ARCH15OXH of representative examples of various periods, genres, and settings, <em>The Oxford Handbook of Roman Sculpture</em> synthesizes current best practices for studying this central medium of Roman art, situating it within the larger fields of art history, classical archaeology, and Roman studies. This volume fills the gap between introductory textbooks&#x2015;which hide the critical apparatus from the reader&#x2015;and the highly focused professional literature. 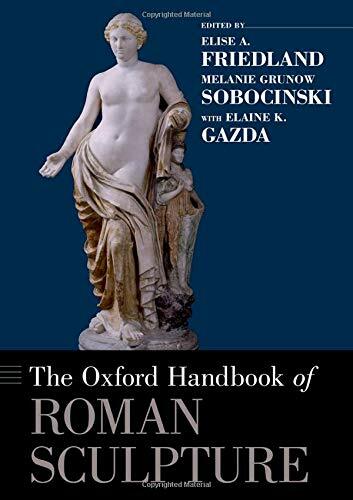 The handbook conveniently presents new technical, scientific, literary, and theoretical approaches to the study of Roman sculpture in one reference volume and complements textbooks and other publications that present well-known works in the corpus. Chronologically, the volume addresses material from the Early Republican period through Late Antiquity. <em>The</em><em>Oxford Handbook of Roman Sculpture</em> not only contributes to the field of classical art and archaeology but also provides a useful reference for classicists and historians of the ancient world.